I haven’t been posting a whole lot about George. The truth is, there just hasn’t been much to tell. In case you’re unfamiliar, George is our Meyer lemon tree. Well, officially he’s a Meyer lemon tree. In actuality, he’s mostly just been a tree. Last summer, I got very excited when he made his first round of flowers. Unfortunately, I learned that both excitement and flowers do not beget lemons. A few months later, he made his second round of flowers. 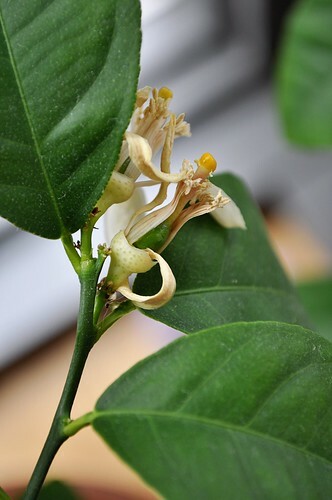 I mostly kept quiet the second time because I wasn’t sure that anything would come of it, and I didn’t want to count my lemons before they grew. Round two did yield the first promising sign that George was growing in the right direction. Little green baby lemons, tucked down in the petals of his flowers showed me that he was at least trying. They didn’t last, though. 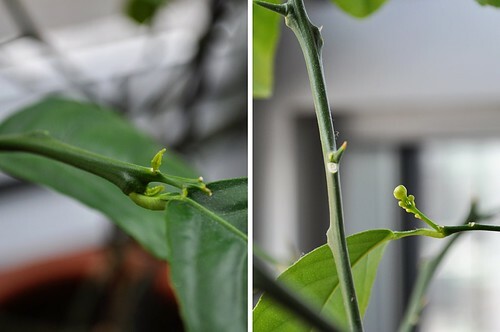 A few days after the flower petals fell, the lemon babies dropped off too. So why am I back to talking about George now? He’s making his third round of flowers. This time, however, the round green growths that I’ve learned will eventually become buds are showing up all over. The first couple times, he produced buds at two or three locations. Each location yielded one to three buds. 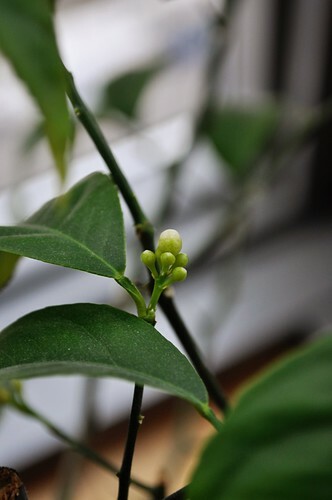 This time, George is making buds at eight different locations. That’s right, eight. And some of them are looking like they’ll produce up to six buds. I’m hopeful. It seems like he may actually have this down. And I think I’ve caught on too. In the past, whenever George started producing new leaves, I’d just let them grow. Most of the time, they’d wind up developing into large branches that would shoot off in obnoxious directions, making him look disproportionate and causing him to fit awkwardly in his corner. I’d end up trimming them off once they were fully grown anyway, so I’ve just started pinching off new leaves as they first begin to develop. 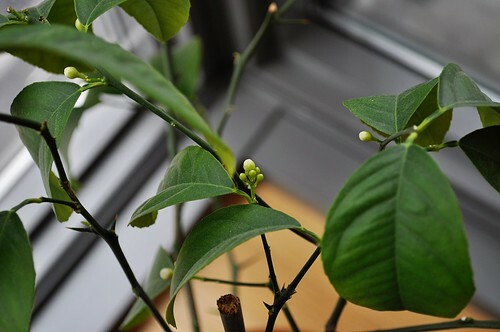 This has kept him looking shapely, and, as a fun side bonus, the leaves give off a pleasant lemony scent when you remove them. But more than any of that, it seems like it’s been helping him to reroute his energies into making flowers and (let’s hope!) fruit. … called mine Meyer – not very original – he did fine during the summer but was not a happy camper inside for the winter. Finally, he shed too many leaves and am searching for a new "Guy" – need to get a new name, too. I think Meyer is a great name! We went through a rough patch with ours, and I had some issues with over-watering at first, but he's doing well now. If you're in the market for a new "guy", we ordered ours online from Four Winds.